This article is based on notes compiled mainly from “The Brothers Wiffen: Memoirs and Miscellanies of Jeremiah Wiffen and Benjamin Wiffen” by Samuel Rowles Pattison, Editor, and “Bibliotheca Wiffeniana” by Eduard Boehmer. 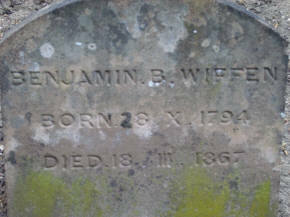 John Wiffen, born 1762, was an ironmonger travelling on business, when he stopped at the town of Woburn. He was a well-educated man, who travelled with books in his saddlebags so he could read them whenever he had the chance. Whilst at Woburn, he met Elizabeth Pattison, a mantua maker (dressmaker) who had premises next door to “The George Inn”, later known as “The Bedford Arms”, and now “The Inn at Woburn”. Elizabeth had been brought up in Aspley Guise by a relative of the How family, (who re-enter this story later.) Both were Quakers, and were married soon after. “In last autumn’s Bedfordshire Magazine [Autumn 1955] I published a portrait of Elizabeth Wiffen, mother of the remarkable literary brothers of Woburn. 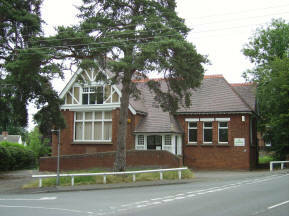 It has now been presented to Luton Museum by Mrs E. S. Boyd Taylor, her great-great-great-grand­daughter. Mr Lea, in his article on the Wiffen brothers, mentioned a memoir that Benjamin Wiffen wrote of his mother, but the account has disappeared. His schoolwork was said to be excellent, and he was well known for his writing and mathematical ability. Some of his woodcuts made before he left Ackworth at the age of 14 in 1806, were thought to have been used in an edition of Aesops Fables. 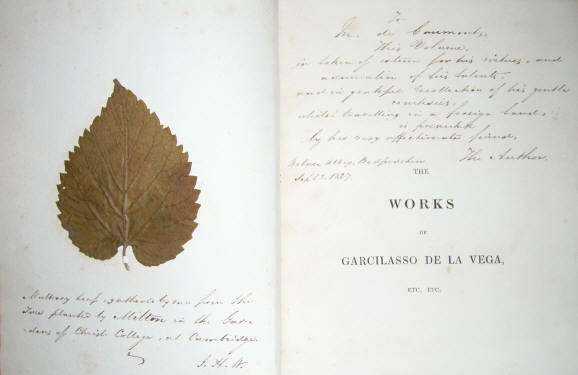 Whilst here, his own poems began to be accepted by popular magazines of the day, such as the European Magazine, to which he contributed “Stanzas on Winter” in volume 47 in January 1805, and another poem to volume 52 in 1807. Around this time, Jeremiah’s sister, Priscilla (Zillah) Maden Wiffen, met and married Alaric Alexander Watts, the poet, who was then also the editor of The New Monthly Magazine. They had a child, Alaric Alfred Watts (1825 – 1901). Zillah also published and wrote for newspapers and magazines like The New Year’s Gift and Juvenile Souvenir (1829-36) until she past away in 1873, nine years after her husband. Sophie, who had also attended Ackworth, was now engaged as a seamstress in Woburn, and Mary was a needlewoman, according to the household bills at Woburn Abbey. 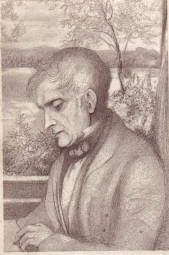 Jeremiah took an extended tour of the Lake District with his brother Benjamin, and their illustrator friend Louis Parez, in 1819. The landscape they saw and the hills they climbed also provided him with much inspiration. They visited Robert Southey, (1774 – 1843) who was another poet of the Romantic school, one of the so-called “Lake Poets”, and Poet Laureate from 1813 to 1843. Southey knew the Duke of Bedford and had visited Woburn Abbey. 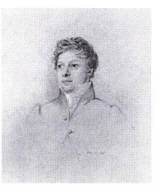 Jeremiah was much taken with this meeting, and later wrote a poem about Southey’s daughters, a picture of whom he had seen on Southey’s mantelpiece. They also went to Rydal Mount, the home of William Wordsworth, and Jeremiah was obviously in awe of the great poet. They talked about the local flora and fauna, and took a tour of his garden, before being invited to come back for tea. They listened as Wordsworth passed comment on the other poets of the day; of whom he admired and whom he felt would disappear into oblivion. Jeremiah recorded in his diary that he thought Wordsworth was rather fonder of talking than listening! On Planting a Slip from Milton’s Mulberry Tree, in the Grounds of Woburn Abbey, Presented by Dr. Thackeray, of Cambridge. Jeremiahs book was named “Jerusalem Delivered: an Epic Poem in Twenty Cantos: Translated Into English Spenserian Verse from the Italian of Tasso: Together with a Life of the Author, Interspersed with Translations of His Verses to the Princess Leonora of Este”. 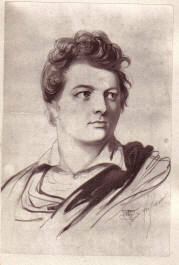 It was illustrated by an engraved portrait of Tasso, after a drawing by Louis Parez, and in the list of subscribers were Scott, Thomas Lawrence, Ugo Foscolo, Samuel Rogers, William Roscoe, Thomas Campbell, Thomas Moore, William Sotheby, Alaric Watts, J. G. Lockhart, David Wilkie, John Flaxman, W. L. Bowles, T. F. Dibdin and B. Barton, who some of the owners of the finest country house libraries of the time and also noted bibliophiles. 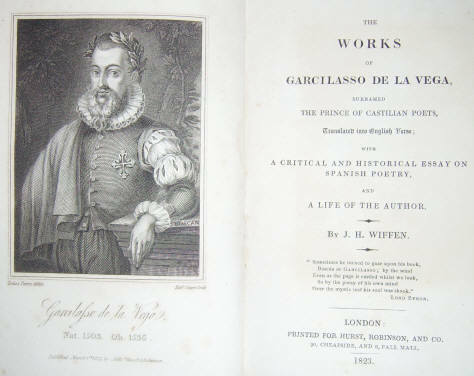 There were two wood engraved vignette illustrations in the text by Williams, also 20 wood engraved canto headings by Williams and Thomson after Henry Corbould and George Hayter (some with tissue guards), and a facsimile of Tasso’s hand-writing. His work at the Abbey is mentioned in his letters, and he recalls finding an early manuscript Chronicle of England, apparently written by the monks of the Abbey. The Duke asked him to read it – no easy matter I imagine to translate these early writings. I do not know if it has survived. 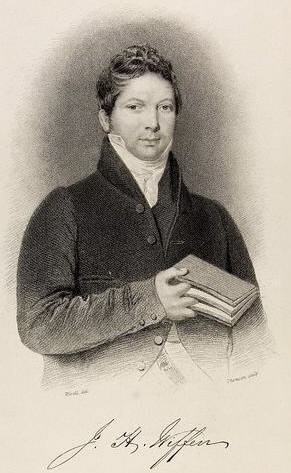 As well as the publications already described, he also contributed poems and sonnets to ‘Elegiac Lines‘ (1818) with his brother Benjamin, and wrote a number of other volumes of poetry: ‘Verses written on the Alameda at Ampthill Park’ (1827), ‘Appeal for the injured African’ (1833), and ‘Verses written in the portico of the temple of liberty at Woburn Abbey, on placing before it the statues of Locke and Erskine, in the summer of 1835‘ (1836). 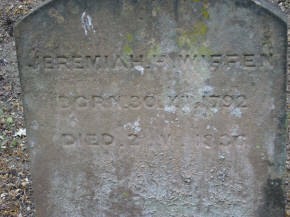 His wife Mary died in 1849, aged 58. Wins to the curious ear o’er the subjected vale. Whisper once more of peace—joys—years long vanished by! From “Poems by three friends” (1813) by Wiffen, Brown and Raffles. I have not been able to establish who wrote which poems in this book To Thomas Campbell, Esq. Henry’s Harp; A Tribute to the Memory of Henry Kirke White. Translated: Horace, 65 – 8BC; Horace, Book 1. Ode 1. To Mecaenas. Translated: Horace, 65 – 8BC; Horace, Book 1. Ode IV. To Sextius. Translated: Horace, 65 – 8BC; Horace, Book 1. Ode XIV. To the Republic. Translated: Horace, 65 – 8BC; Horace, Book II. Ode III. To Delius. “Et longum, formose, vale! vale! inquit Iola.”—Virgil. 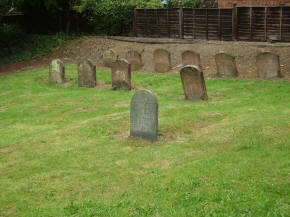 Benjamin retired from business in 1838 on health grounds, and he, his mother and his sisters moved to a house “The Haven”, at the very end of Mount Pleasant, in Aspley Guise. His mother died three years later. 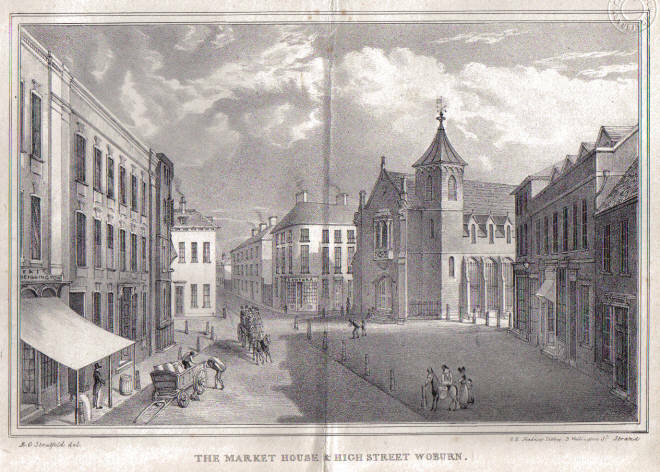 Their shop continued in the ironmongery business until it was demolished after the First World War, and on its site now stands the Woburn War Memorial. Richard How died in 1835, and lodged at Bedfordshire and Luton Archives [Z813/1] is Benjamins hand written memorial to him, penned in 1840. In fine copperplate handwriting, the book is titled “Memorial of Richard Thomas How addressed to those who knew him not”. It is dedicated to Richard Edward White [whose own diary features in some research on another part of this site] “…in the hope that his children’s children will preserve the memory of one of their ancestors in order to imitate his virtues.” It is over 300 pages long, describing not only Richard How, but his house and gardens in Aspley Guise, the Hogsty End Meeting House and the local Quaker community. Benjamin was still very actively involved in the Quaker community himself, looking after the records of the Meeting House until the Registration Act of 1837. After Benjamin’s death, his collected notes on each of the authors he had researched were used by Ed. Boehmer, D.D., Ph.D., the Ordinary Professor of the Romance Languages to the University of Strasburg, to produce “Bibliotheca Wiffeniana, – Spanish Reformers of two Centuries, from 1520, their lives and writings, according to the late Benjamin B. Wiffen’s plan, and with the use of his materials”. This was published in three volumes between 1874 – 1904, and it also included a memoir of Benjamin by Isaline Wiffen, Jeremiah’s daughter.